The Peace and Conflict Studies International Graduate Student Conference Committee is now accepting proposals for its 3rd Peace and Conflict Studies International Graduate Students Conference, taking place February 1- 2, 2019. Complete applications will include an abstract of 250-350 words, as well as an author bio including name, contact information, and the applicant’s institutional/organizational affiliation. Please email your abstract to the PACS Student Association (pacssaexecutive@gmail.com) by November 30, 2018. 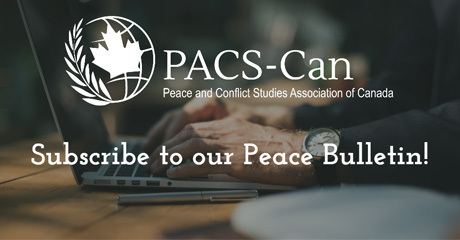 We find ourselves at a unique and significant crossroads where peace studies and peacebuilding are in transition to more critical and emancipatory approaches. The developing relationships and interdependence that cut across borders, cultures, ethnicities, genders, sexualities, and (dis)abilities have brought a new focus to the field of Peace and Conflict Studies. Hence, strategies for building sustainable peace are sought to envision a new inclusive future. •and/or other contemporary peace topics.